Metatron appears in BG's Canteen. A lot of remarkable music was created in this space. B.G. 's Canteen. Now it's not as well known as The Bitter End or The Gaslight, but some amazing musicians got their start on this stage. God's Bar is a construct created by Chuck Shurley to be the safest place in all of creation. Modeled after B.G. 's Canteen, Chuck had apparently been holed up in it since Amara was released into the world, working on his autobiography. Chuck summoned Metatron to BG's Canteen to help finish his autobiography. 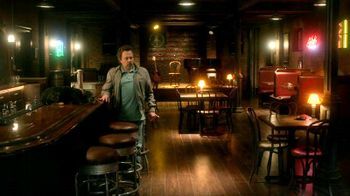 At first Metatron called the bar crappy, but after Chuck revealed himself to be God, Metatron grovels and tells him that the bar looks like the bar from Cheers. Chuck explains the history of the bar about how a lot of musicians got their start on that very stage in the bar, but that it is not as well known as The Bitter End or The Gaslight Cafe from New York City. While Metatron tries to help inspire Chuck to be more truthful in his book, Chuck lets it slip that the bar is the safest place ever created and Metatron later deduces that the bar was created to keep him safe from Amara. Metatron goes on to call out Chuck for being a coward after discovering that he is going to let Amara destroy everything, which Chuck responds by flinging him out the doors, injuring his arm. Chuck tells him that he is finished watching humanity's failures and makes a series of TVs appear on the wall over the stage which all report the rabid fog killing people. Metatron later tells Chuck that humanity is more than the disastrous creatures he built them up to be and Chuck, devastated at losing faith in humanity, decides to help Sam and Dean stop the Darkness. While he plays a song, Metatron looks over his newly revised version of Chuck's autobiography and is shocked at its contents. The Bitter End and The Gaslight Cafe are famous rock and folk venues in New York City. The name "BG's" is a reference to another legendary New Music club CBGB. In 10.09 The Things We Left Behind Dean talks about sneaking out and getting drunk at CBGB when he was a teenager.